Guns-E-Num | way above the level. Wow, those Groningen peeps really on a killing spree right now and kill everything in sight. 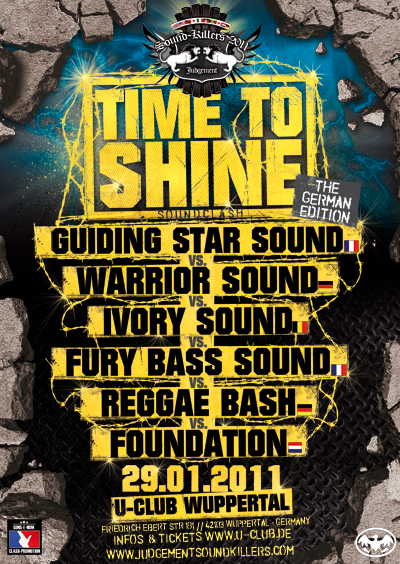 Foundation Sound just took the Soundkillers 2011: Time 2 Shine clash yesterday against Warrior Sound in Dub fi Dub. Don’t know much bout the clash yet, but gotta let you know. Big up Zebulon and the crew. 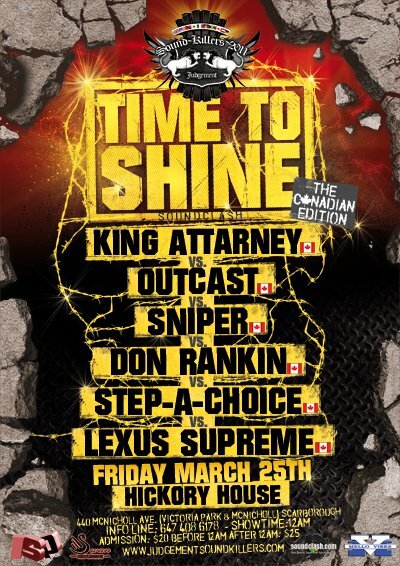 Warrior Sound starting d war… 2nd Fury Bass, 3rd Guidind Star, 4th Reggae Bash,5th Ivory Sound and last but not least Foundation! Foundation starting hard no bloodclaat! Fury Bass bring a likkle youth pon stage. voice like young Yami Bolo! Ok Reggaebash playin a MaikalX in d singers round!! One sound and then we gonna eliminate d next sound. 3 sounds left after this round! clash a gwaan good. Foundation a play now and dem gwaan good! 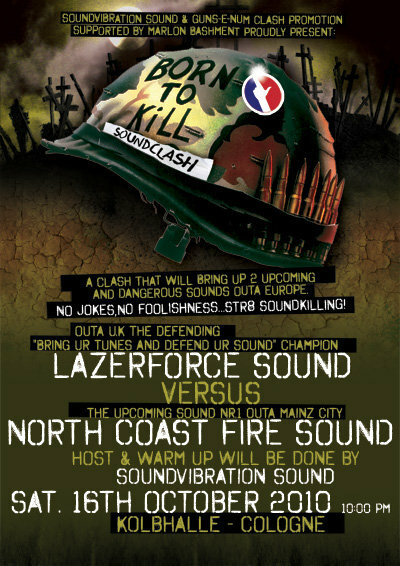 The Promoter has found a new date for the postponed Born to Kill Soundclash between London’s Lazerforce Sound and Northcoast Fire Sound from Mainz, Germany. New Flyer sameway.